In 1993, Verizon New Jersey convinced the Garden State that they would replace 100% of the aging copper wires of the state-based Public Switched Telephone Networks (PSTN) -- the utility, with a fiber optic wire capable of 45 Mbps in both directions and it would be completed by 2010. Residential and business customers, municipalities as well as schools and libraries would all have a fast lane on the information superhighway. But there was a catch: Verizon wanted customers to pay for the building as the claimed they would use this excess booty on upgrading the networks. Known as "Opportunity New Jersey," the laws were changed and it started the clock to give Verizon more profits and tax breaks. The question becomes: How much money did Verizon get from these deregulatory gifts? I've been asked how I calculated Verizon New Jersey's overcharging of customers and my answer is -- slowly, carefully and using Verizon's own data (and I started tracking the financials for a chapter in my first book, published in 1998). And it comes to about $15 billion dollars and counting and this is actually the low number, as I will discuss. "Kushnick's Law: A regulated company will always renege on promises to provide public benefits tomorrow in exchange for regulatory and financial benefits today." 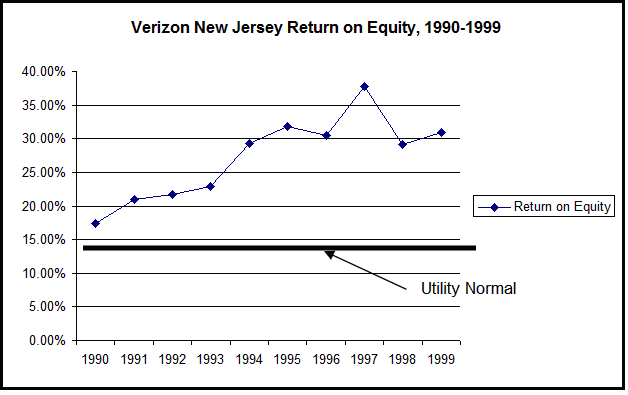 The chart above shows the increase to Verizon New Jersey's profits from 1990-through 1999. I call it Phase 1. The standard returns for a utility for decades prior to this deregulation were about 10%-12% -- that's the "utility normal" line at the bottom of the chart. The overall profits for the state-based companies, like Verizon New Jersey, were about 15%-20%. (i.e., this includes not just the networks but the other revenues and fees.) As you can see, after the law was passed -- it was Christmas, Chanukah, and any other holiday where gifts are received. Verizon New Jersey's profits jumped from 20% to 40%, dividends had massive increases, and Verizon was able to start writing off the networks faster and used this as 'tax benefits'. In fact, in 1993, Verizon New Jersey took a $1 billion dollar tax write-off, claiming that they were replacing the copper landlines with fiber optic landlines. NOTE: In 1993 the company was called New Jersey Bell, then changed to Bell Atlantic-New Jersey, then to Verizon New Jersey. Imagine if your business profits doubled or tripled in one year without you doing anything extra, and it stayed that way for years. But don't take my word for this new found wealth. In 1997, Economics & Technology wrote a report which included Opportunity New Jersey. "Under the Opportunity New Jersey (ONJ) Plan, Bell Atlantic-New Jersey *(now Verizon New Jersey) has enjoyed major financial benefits even though it has not increased its investment as promised and has opposed competition at every turn. The increased pricing and earnings flexibility coupled with reduced investment and continued monopoly pricing practices has enabled BA-NJ's profits to soar under alternative regulation. Consumers clearly have suffered under the ONJ Plan from unnecessarily inflated prices for many services, and have received few benefits in the form of new services and increased competitive choices." "BA-NJ's financial return on equity (ROE) jumped from 22% to almost 40%. 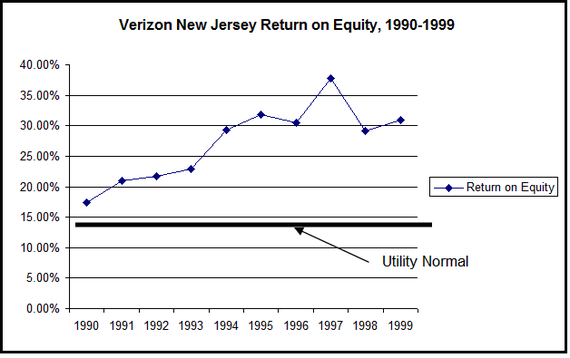 In 1997, BA-NJ provided a559-million dividend to its parent -- equating to approximately93.17 per access line per year (or7.76 per line per month). By way of comparison, BA NY's dividend was only42.52 on a per-access line basis (3.54 per line per month)." "...'people have paid for the fiber optic lines through their monthly bills', she said, 'but they have not yet benefited'." "Bell Atlantic-New Jersey (BA-NJ) has over-earned, underspent and inequitably deployed advanced telecommunications technology to business customers, while largely neglecting schools and libraries, low-income and residential ratepayers and consumers in Urban Enterprise Zones as well as urban and rural areas." In fact, according to the NJ Advocate, Verizon New Jersey only spent $79 million on construction, instead of the $1.5 billion that was promised. The Advocate continued. By 1997, almost one billion dollars of excess profits and a return on equity almost twice what a regulated monopoly should be making was their reward. "Since the time of the adoption of the ONJ Plan, BA-NJ has received enormous financial benefits, greatly in excess of the Company's original projections. The gains captured by BA-NJ, which probably would not have been achievable but for the Plan, as set forth immediately below, involve earnings, dividends, return on equity, cost of debt and additional benefits." *Dividends, in this case, are the monies that New Jersey Bell paid to Bell Atlantic, the holding company. And there were lots of ways to make more money. This simplest -- the company got rid of most regulations on almost all of the ancillary services like calling features, such as Call Waiting, Call Forwarding or Caller ID, or raised rates on unpublished numbers or inside wiring -- you name it. This chart is from the Florida Public Service Commission from 1999. It shows that while Call Waiting cost less than one cent to offer it had a $3.99 profit per item, per month, while Caller ID had a $7.28 profit margin -- and this was about 15 years ago. Should I go on? Well, what's a few billion between friends? Unfortunately, by 2006, Verizon New Jersey had not deployed any fiber optic residential services. So where did all the money go? In 2002 we wrote a series of reports on the Bell company financials, which covered 1999 through the first half of 2002. Verizon had lost money or took tax deductions totaling $17 billion dollars which were driven by massive overseas losses and mergers. The company took a massive $4.7.billion dollar write-off in Cable & Wireless, NTL and Metromedia Fiber. Moreover, the South American investments caused problems. For example, Verizon took a charge of $672 million for its holdings in CTI, a cellular subsidiary in Argentina, and in the second quarter of 2002, Verizon took a $1.4 billion write-off for their investment in Compania Anonima Nacional Telefonos de Venezuela (CANTV). Base salary went up 25% over the three years while his bonuses and "awards" were 1045% above salary. According to the BellTel Retirees, staffers with 30 years at the company hadn't gotten a cost of living increase in a decade. But the other senior executives also prospered as the mergers of Bell Atlantic and GTE, which created Verizon, allowed them to get stock which had an estimated value of $424 million to over $1 billion dollars -- even though the company had massive losses overseas. And yet, in New Jersey, Verizon annual infrastructure reports claimed that the company was fulfilling their obligations to fiberize the state -- even though nothing had been done. Feeling kind of nauseous or light-headed? We recommend 'Meclizine', the active ingredient in Dramamine. By end of 2009, we went back and examined every year and estimated that the company had collected between $13-$17 billion extra from 1992-2009, from excess depreciation, excess dividend payments, added expenses dumped in to the costs like charging customers for name changes (Bell Atlantic when it combined with NYNEX, or the creation of Verizon, etc.) or the related the merger expenses, and every else that had nothing to do with upgrading the state of New Jersey's networks. In fact, Verizon New Jersey underspent about $1.0 to $2.7 billion dollars on construction by 2009, monies that should have been spent to do the upgrades. Meanwhile, over the last decade there have been no state audits to examine the books; there has been no tracking of overseas payments or executive pay or anything else by the State. And the NJBPU never even bothered to fully examine the filings of Verizon NJ to see if the company was on track and had done the upgrades as promised. Part 3: Oh, But, It Gets Worse, 2009-2014. And another kicker-- In 2009, Verizon corporate showed 367 companies that they invested in or owned in over 150 countries. But when I said it is going to get worse, it's not just a turn of phrase. I meant it. We have filed comments with the New Jersey Board of Public Utilities, which outlines a series of OPRA, "Open Public Record Act," requests and a call for an investigation, which I will explain in the next few articles. Why? Because Verizon is hiding their financial secrets. Starting in 2007, the FCC stopped publishing any data on state-based companies, like Verizon New Jersey. In 2010, Verizon stopped publishing the state-based SEC reports, and the New Jersey Board of Public Utilities never made the company's financial books public. And the corporate annual reports are more fairy-tale like as they have no granularity of the details so there's nothing about, for example, Verizon's New Jersey's financials. To end this tale, we should tell you about one of the affiliate companies, something called "Verizon Services," which is a garbage pail of expenses that dumps them into the utility, helping to create these losses. This kitchen sink of expenses may include, well, everything from the executive pay, the lobbying to harm you, the lawyers to defend Verizon against you, and the pay-offs using their foundation monies to shut up those non-profits and minority groups that have lost their way and now work for their funding sources and not their own constituents. Who is Verizon Services? This is from Verizon New Jersey's 4th quarter, 2010 report. "We (Verizon New Jersey) have contractual arrangements with Verizon Services for the provision of various centralized services. ...These services include marketing, sales, legal, accounting, finance, data processing, materials management, procurement, labor relations, and staff support for various network operations. The second category is comprised of overhead and support services which generally benefit all subsidiaries of Verizon. Such services include corporate governance, corporate finance, external affairs, legal, media relations, employee communications, corporate advertising, human resources, treasury, and rent expenses associated with the rental of facilities and equipment." In our next few articles we will discuss the massive cross-subsidies that caused the losses and more overcharging of customers that we anticipated. To conclude, the $15 billion number was our 'average' estimate from 2009. With these new revelations since the last published SEC reports, it could be $20 billion or more and counting by the end of 2014.